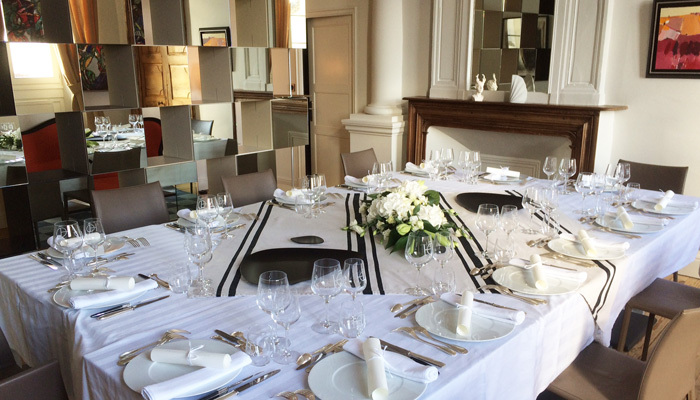 Hosts table of "Hôtel particulier Guilhon"
Possibility to dine by reservation 24 hours in advance, on Tuesday, Wednesday, Thursday and Saturday evening. Dinners are held at the owners table and with other guests who have booked. The menu includes starter, main course and dessert and is the same for all guests, consisting only of fresh regional products according to the market and the seasons. The price is 35 euros per person excluding wines. A menu formula with 2 glasses of wine is proposed at 45 euros. The wine list is exclusively made up of regional wines.